that saves the measured data for downloading to a PC type computer. These readings are also plotted graphically on a LCD screen as the operator moves along the traverse. Two storage containers are provided, one for the coils and another for the receiver, transmitter, battery charger and cables. The receiver controls the transmitter and has the following specifications: It has eight measurement frequencies; 3200, 1600, 800, 500, 250, 125, 75 and 20 hertz. Other frequencies can be supplied on request. The receiver is menu driven and input from the operator is via a 16 key, key-pad. The display is a graphic LCD display. During a measurement cycle; frequencies and gain of the amplifier is automatically selected. A measurement is made with a single push of a button. A reading takes approximately 20 seconds. Readings of amplitude and phase of the received signal is saved on a SD card for retrieval. Up to 50000 stations can be saved to the SD card. Readings are plotted on the LCD screen in real time. The receiver has a USB interface for downloading data to a PC type computer, running Windows. 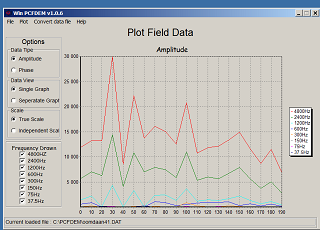 PCFDEM software is supplied to download, plot and convert the field data. Surfer files can be generated for pseudo sections as well as frequency specific grid contour maps. 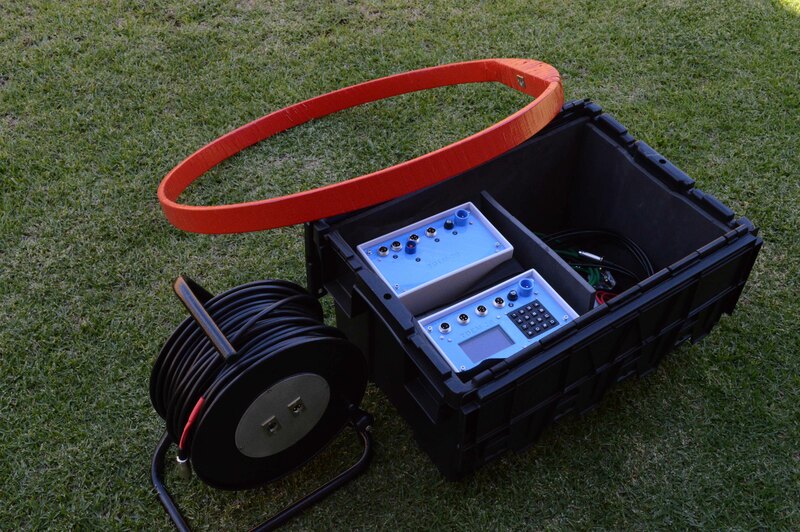 ESU-4 electro-seismic unit employs the electro seismic or electro kinetic principle to enable the operator to make an estimate if there is groundwater present and approximately at what depth. A hammer is used as a seismic source and four brass electrodes as inputs. Trigger input is from a hammer-switch. It is powered by an internal rechargeable battery. Data stacking is used to cancel noise. After each hammer blow the stacked signal is displayed graphically on a LCD screen. Stacked data is saved to a SD card for later retrieval. Up to 100000 stations can be saved for downloading to a PC using a USB interface. A geophysical hammer source can be used to create a seismic pulse which travels downwards into subsurface rock. This reaches the water table, where the rock is permeable; the water is forced to move relative to its rock surroundings as the pulse passes. This motion creates a small electrical pulse from each aquifer layer. The electrical signals are measurable at the surface by using pairs of electrodes close to the shot point. 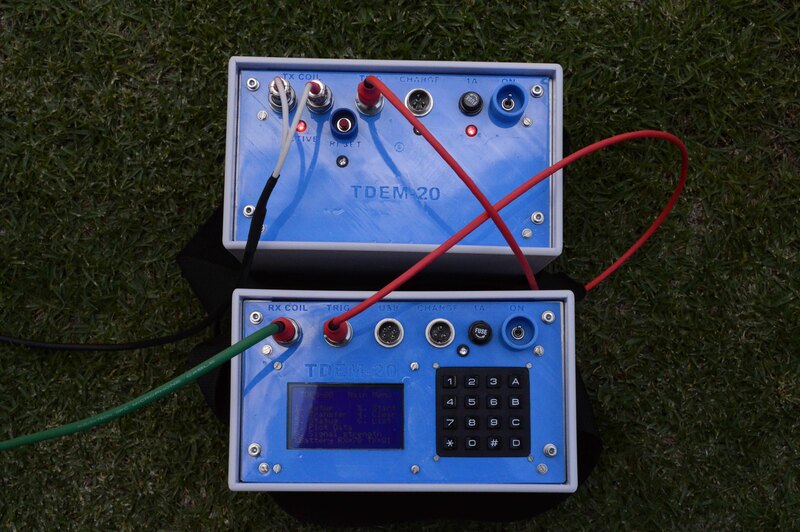 The TDEM 20 is a single channel, battery operated, time domain EM system. It uses a wide bandwidth, input amplifier that auto ranges and a 18 bit A/D converter to digitize the received signal. Twenty time gates are numerically integrated and can be stacked up to 10000 times to minimize noise. The sample rate of the receiver can be varied as well as the transmitter output pulse width. The stacked pulse is displayed graphically and saved to SD card. Up to 250 stations can be saved. A reference signal is generated by the receiver for the transmitter via a cable.